Yesterday I mentioned the yard art which is now prominently on display at a Tiki Styled Home in Beverly Green. 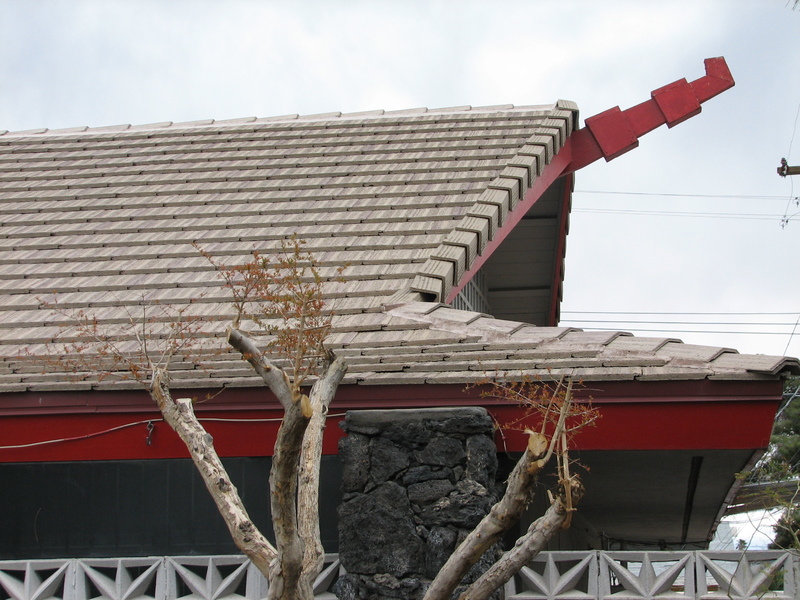 Of course, someone asked me about Tiki, so I’m compelled to show some other examples from the Vintage Vegas Neighborhoods and to talk a little about the subject. 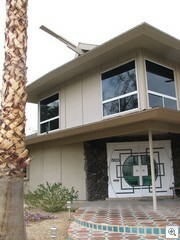 One of the great examples of Tiki influence is on the “Jackie Gaughan” house on Chapman, at the corner of Bonita. It also sports one of the few pairs of round doors in all of Las Vegas. The “Jimmy The Greek” home on 6th Street South of Charleston is also Tiki Themed. Some of the prominent features are roof lines that slope upwards at the end, and beams that protrude past the facia boards, to resemble the bow of a ship. When I was a kid in Columbus Ohio, I got my first “taste” of Tiki at the world famous Kahiki Supper Club. 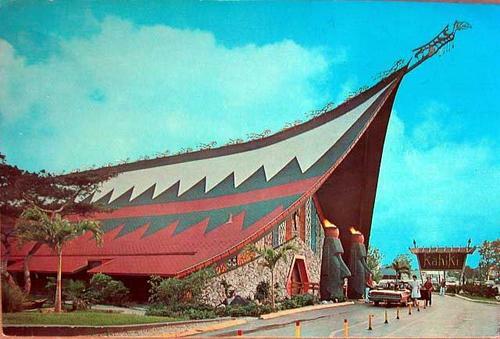 It was renowned as one of the best examples in the world of Tiki Culture taken over the top. Alas, it’s a Walgreen now. Oh Well, so much for historic preservation. It’s also easy to spot a touch of tiki in the Cinderella Ranches on both the east and west side neighborhoods of Vintage Vegas. PS: The outcry was huge in Columbus when the Kahiki was torn down to become a Walgreens, but the powers that be, and the big money wouldn’t listen. Another drug store was much more important, it seems. We have lots of stories here in Las Vegas about our lost heritage, history and architecture. That’s why we’re so hell bent on preserving the Huntrudge, Maude Frazier Hall, La Concha, and what little is left that’s worth fighting to preserve. Join Us. Get involved with the Atomic Age Alliance, or Classic Las Vegas, or the Neon Museum or any of the other museums in Las Vegas. We need your help, and you’ll meet some remarkable people.